Are you acclimated to the heat yet? Sometimes I can’t tell what’s normal anymore. If sweat is dripping down my back because it’s genuinely hotter and muggier than usual out there, or if I’m just not as used to it because I’m not training for a marathon this year — 6 miles is the maximum my ankle and I have in me, and usually less (and I’m still dripping). So when I had leftover buttermilk to use up earlier this week, I took the safe route, stayed away from the oven, and churned some buttermilk ice cream instead. Paired with my overload of local blueberries and leftover graham crackers from an earlier key lime pie and it was the best damn ice cream I think I’ve ever made. Buttermilk adds a gorgeous tang and depth to ice cream. 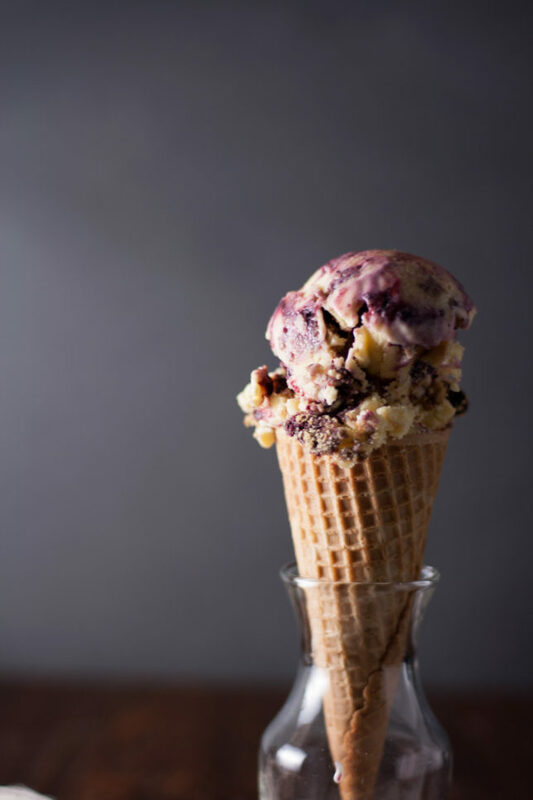 Initially, I loved the idea of making it without egg yolks à la David Lebovitz — no potentially fussy custard, no stovetop time, cold ingredients from the start — but the more I thought about it and did my research, I realized that to be true to myself, I had to admit that just I love custard-based ice creams. I love their creaminess, their decadence. Yet there’s something about them that never seems too heavy for me, so long as they’re packed with flavor. Thanks to the buttermilk and a touch of Greek yogurt and honey, this is that. But I couldn’t stop there. 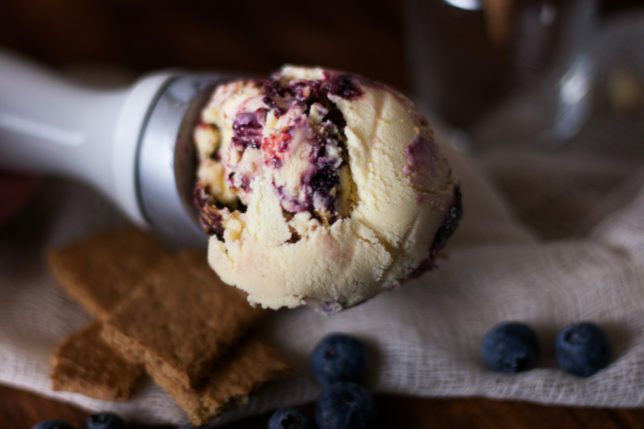 Ben & Jerry’s makes an amazing blueberry Greek frozen yogurt with a graham cracker swirl. My friend Emily introduced me to it, and we got hooked — very hooked. So hooked that the fella and I could split a container between us in one night and not feel like we were weighted down by half a pint of your usual Ben & Jerry’s. But now we can never find it. 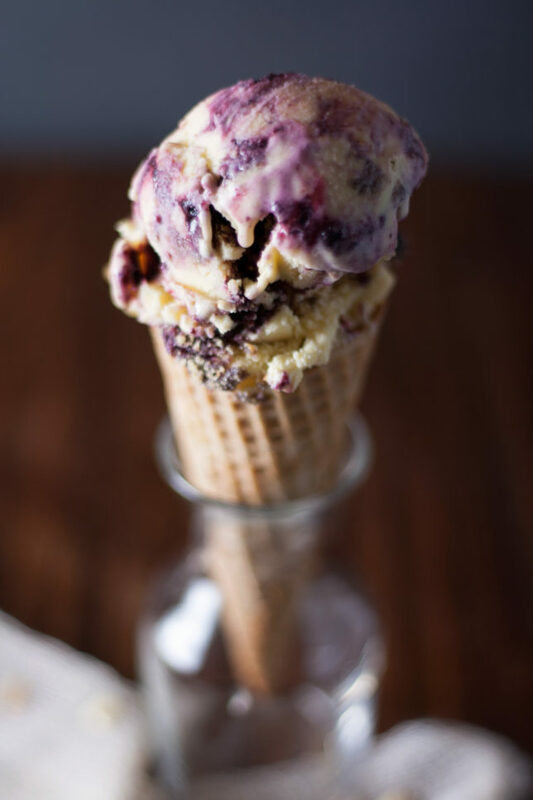 Enter this lovely addition of blueberry sauce and crushed grahams into the buttermilk ice cream. 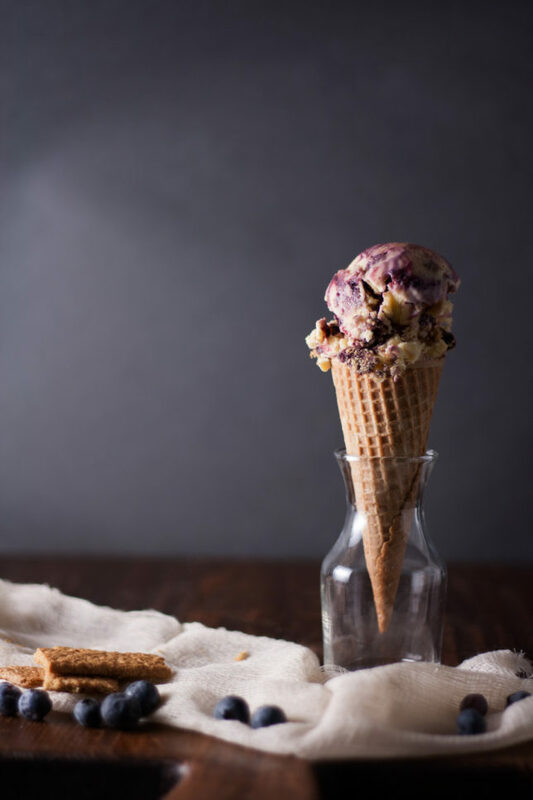 I could have added blueberries directly to the ice cream base and called it a day, but I didn’t want to muddy the rich, velvety buttermilk flavor. Instead, I layered them, essentially creating a swirl as it’s scooped. It’s fresher, lighter somehow. Aside from the inspiration, Ben and Jerry also tell me that this is national ice cream month, so if you have an ice cream maker and are not making this, you’re pretty much going against the rules set forth by whomever creates food days and months and thus could maybe be thrown in jail. But seriously, this ice cream is so good, so creamy, so rich, yet so feel-good and velvety light, it’s all I want to eat. After all, what better way to acclimate to summer than with ice cream? A couple of tips for ice cream making: make sure your ingredients — in this case, your ice cream base and your blueberry sauce — are cold cold cold before you churn. This will help minimize the time needed in the ice cream maker, ensuring a creamy consistency in the finished product and helping to minimize ice crystal formation. I also like to throw my ice cream container in the freezer for a bit before I scoop it from the ice cream maker. Bring cream to a gentle simmer in a medium saucepan over medium heat. Be careful not to let it boil. Meanwhile, in a medium bowl, whisk together egg yolks and sugar until smooth. When the cream is hot but not boiling, whisk half of it slowly into the egg mixture. Pour it back to the saucepan with the remaining cream and add honey, stirring continuously over medium low heat until custard is thick enough to coat the back of a spoon. Place a fine-mesh strainer over a large bowl and pour custard through to catch any cooked egg. Whisk in buttermilk, yogurt, vanilla, and salt until smooth. Cover with plastic wrap, pressing it gently over the mixture to prevent a skin from forming, and refrigerate until cold, at least two hours. In a medium saucepan, combine blueberries, sugar, golden syrup or corn syrup, lemon juice, and salt, and mash with a potato masher or a fork. Cook over medium-high heat, stirring occasionally, until the juice reduces to a syrupy consistency, about 5-7 minutes. You will have about ¾ cup of blueberry sauce. Transfer to a bowl, cover, and chill thoroughly. Churn ice cream base according to your ice cream maker’s instructions. When it’s the consistency of soft serve, layer ⅓ of the ice cream into the bottom of a freezer-safe container (I used a metal loaf pan, which stays nice and cold). 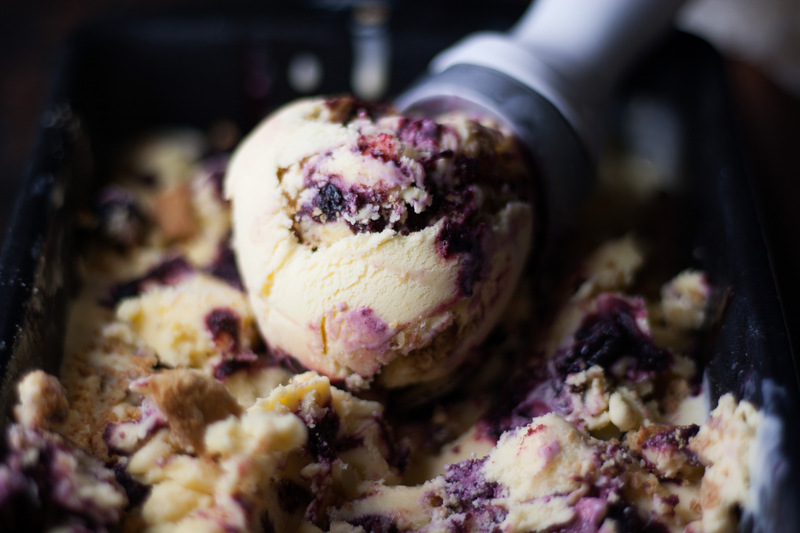 Stir the blueberry sauce, and dollop about half over the ice cream. Add half the crumbled graham crackers. Repeat with the rest of the ice cream, blueberry sauce, and graham crackers. You should end with a top layer of ice cream, but dollop any extra sauce or sprinkle any extra graham crackers to finish. Cover and freeze until firm, about 4 hours.